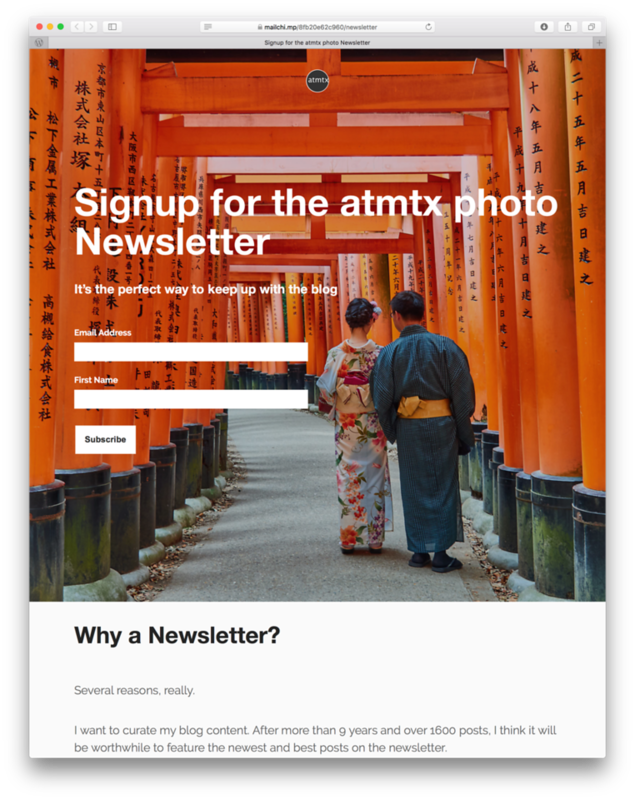 In yesterday’s post about my social media diet, I did a soft announcement of my new atmtx photo Newsletter. A big thank you to the folks that already signed up. Today is the official announcement. Pictured above is the landing page to signup for the newsletter. I’m using a service called Mailchimp, which specializes in creating email lists. They are what you call an email marketing platform. Something way more than I need but the service seems professional and easy to use. All I want to do is send out newsletters to a selected group of enthusiasts. I’m not planning any elaborate campaigns, A/B testing or other marketing related activities. Though, figuring out the service was moderately interesting. Playing with a new service or technology is always an opportunity to learn. This newsletter is a perfect way to stay in touch with the blog. I plan to highlight the best of my posts, old and new. I’ll add additional stories and perspectives, above and beyond what I write here. I’ll talk about up and coming posts, and feature photographs that I haven’t published anywhere else. Basically, it’s for enthusiasts who like photography, travel, stories, with a sprinkling of camera gear, of course. I’m keeping this low-key, sending out an issue once a month, on average. It’s yet another one of my experiments and we’ll see how it turns out. I promise that I won’t bombard you with emails. I spend enough time posting once a day on this blog; I don’t have the time, energy or desire to make this a high volume operation. I also know you are busy and I don’t want to add too much noise to your email inbox. However, my objective is to make this worthwhile, especially for the people who like my stuff. This newsletter is not for everyone. I’m not resorting to shenanigans to trick you into signing up. Just a low-key message and a link at the bottom of my posts. That’s true, perhaps a throwback ebook explaining how to create HDRs?